[160 Pages Report] The UV Stabilizers Market is projected to reach USD 1.51 Billion by 2021, at a CAGR of 6.7% from 2016 to 2021. In this study, 2015 has been considered as the base year and the forecast period has been considered from 2016 to 2021 to estimate the global market of UV stabilizers. The growing demand for UV stabilizers in the Asia-Pacific region coupled with the increasing demand for packaging materials, and automotive components & coatings are expected to drive the global UV stabilizers market during the forecast period. This research study used extensive secondary sources, directories, and databases such as Hoovers, Bloomberg BusinessWeek, and Factiva to identify and collect information useful for this technical, market-oriented, and commercial study of the global UV stabilizers market. Primary sources are mainly several industry experts from the core and related industries and preferred suppliers, manufacturers, distributors, service providers, and organizations related to all segments of the industry’s supply chain. The bottom-up approach was employed to estimate the global market size of UV stabilizers on the basis of type, application, and region, in terms of value. The top-down approach was implemented to validate the market size, in terms of value. With the data triangulation procedure and validation of data through primary interviews, the exact values of the overall parent market and individual market sizes have been determined and confirmed in this study. The UV stabilizers supply chain includes raw material manufacturers such as Oakwood Products, Inc. (U.S.), Tokyo Chemical Industry Co., Ltd. (Japan), and Ineos (Switzerland), which are the major producers of raw materials. Furthermore, products manufactured by these companies are used by UV stabilizers manufacturers. BASF SE (Germany), Songwon Industrial Co., Ltd. (South Korea), Solvay SA (Belgium), Addivant (U.S.), and Clariant AG (Switzerland) are the major manufacturers of UV stabilizers. This research report categorizes the global market for UV stabilizers based on type, application, and region, and forecasts revenue growth and provides an analysis of trends in each of the submarkets. These segments are further described in detail with their subsegments in the report with value forecast till 2021. The global UV stabilizers market is projected to reach USD 1.51 Billion by 2021, at a CAGR of 6.7% from 2016 to 2021. UV stabilizers are witnessing growth in demand from the Asia-Pacific region, mainly from China. New product development and expansion activities that have been undertaken by different companies for increasing their production capacity in the Asia-Pacific region is the key factor driving the UV stabilizers market. UV stabilizers find application in packaging and automotive industries with HALS and UV absorbers. Increasing demand from industries such as packaging and automotive has promoted the usage of UV stabilizers. In addition, the rise in demand for greenhouse films is expected to drive the UV stabilizers market during the forecast period. Based on type, the HALS segment is projected to lead the UV stabilizers market from 2016 to 2021. HALS is majorly used in packaging and automotive industries. In addition, HALS finds application in food and non-food packaging. The demand for UV absorbers is mainly driven by its ability to provide a low-cost solution, good processing ability, improved weather ability, and low volatility to industries such as high-performance thermoplastics, polyurethanes, polymers, automotive, and packaging, among others. These factors are expected to fuel the growth of the UV stabilizers market during the forecast period. The Asia-Pacific region dominated the UV stabilizers market, in terms of value and volume, in 2015, and is expected to continue its dominance during the forecast period. China, South Korea, and Japan are the major consumers of UV stabilizers in the Asia-Pacific region. The demand for UV stabilizers in the APAC region is primarily driven by the increase in population and rapid urbanization in these countries, which is creating the demand for packaged goods and automotive. 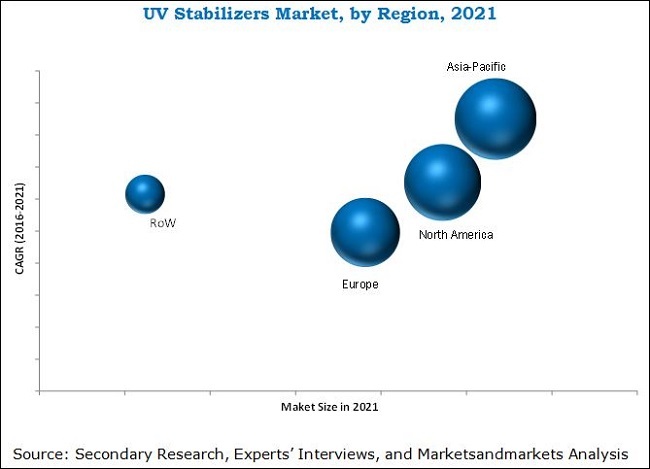 Rising investments by foreign companies, growing production facilities, strong industrial base for packaging and automotive sectors, and increasing standard of living are the other major factors contributing to the growth of the UV stabilizers market in the region. China is a major growing economy in the world, and the demand for UV stabilizers is expected to increase in the country during the forecast period. Though the UV stabilizers market is growing at a high rate, few factors are acting as restraints in the growth of the UV stabilizers market. Volatility in UV stabilizers raw material prices and stringent government regulations are the major factors restraining the growth of the UV stabilizers market. Companies such as BASF SE (Germany), Clariant AG (Switzerland), Cytec Solvay Group (U.S.), Evonik Industries AG (Germany), and Songwon Industrial Co., Ltd. (South Korea) are the leading players in the global UV stabilizers market. 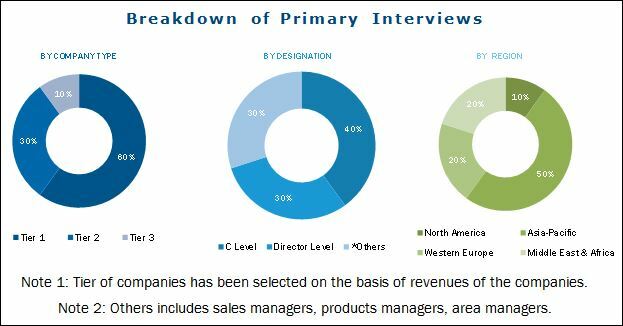 These companies are adopting various organic and inorganic growth strategies such as new product development, expansions, acquisitions, and joint ventures to increase their market shares. 11.2 Songwon Industrial Co., Ltd.
11.11.1 Everlight Chemical Industrial Corporation. 11.11.3 Chemipro Kasei Kaisha, Ltd.
11.11.4 Chitec Technology Co., Ltd.
11.11.6 Everspring Chemical Co., Ltd.